Radio programmes are to be broadcast from a ship in the North Sea 40 years after the first attempt to silence the pirate stations. 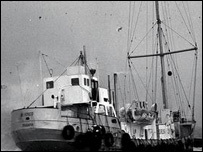 BBC Essex marks the 40th anniversary of offshore pirate radio at Easter by broadcasting from a ship off Harwich. Some of the stars from the 60s will fill guest slots. Pirate BBC Essex will broadcast on medium wave frequencies from LV Eighteen - a former lightship owned by the charity Pharos Trust. DJs from the pirate radio glory days between 1964 and 1967 will recreate the sounds of those times. They hope to raise money to turn the vessel into a visitor and educational attraction. Among the presenters on the week-long radio output will be original pirate broadcaster Dave Cash who said: "It's just wonderful to see it all happen again. "When we first went out on the ships there were three older guys Tony Windsor, Paul Casarin and Earl Richmond with me and Kenny Everett and Keith Skues. "Now Keith and I are the older guys working with DJs from BBC Essex. It's come full circle."